A night party with attractive glow theme can be made more enjoyable. Using glow sticks is the cheapest and best option for partying in dark with colorful light. As you know, glow necklaces and bracelets are the common products of glow sticks seen at night parties. Apart from these, many other glow products like glow straws can be used to make your party more amazing. Glow straws are clear straws in which a glow stick capsule is fixed inside. When you sip the liquid through the straw, the capsule of glow sticks moves up in tandem. It falls down back in between sips. You can enjoy this mesmerizing effect of the movement of light shooting up the straw. It is because of this motion that these straws are sometimes called as ‘glow motion straws’. This amusing movement of mini glow sticks in glow straws brings fun for your guests. Just bend the glow sticks to break the glass ampoule and activate it by shaking well so that the chemicals are mixed properly. The glow sticks inside these straws are 1.5 inch in length and are found in different colors including neon-like colors. You can even customize the glow straws by imprinting your business logo or any other message. Make your special events and drink promotions more attractive by using custom printed light up straws. Be careful when purchasing glow straws as some glow straws are available as translucent straws with a ‘glow in the dark’ coating. The standard glow straws having mini glow sticks glow for about 8 hours that is enough for your night party time. 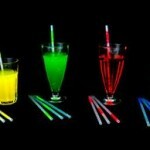 Order wholesale glow straws for your next party at the drink sections and surprise your guests. Previous Article How to Make Glow-in-the-Dark Drinks in Night Parties?